Home|Floral Library|Stonecrop – Sedum spp. Decorative Life: About 8 days. One recommendation is to store them near 60F but no data presented to support this seemingly high temperature recommendation. From the Latin “sedo” or “sedere” (to sit) and to “assuage”, from the healing properties of the house-leak. Latin names are often misapplied to plants in cultivation. 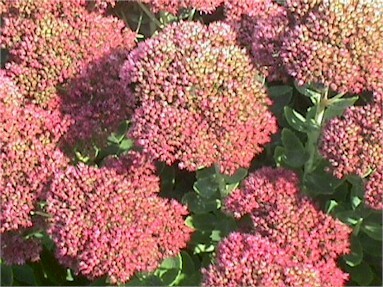 ‘Autumn Joy’ is a reported to be popular cultivar. Many members of this family are noted for their dense and compact growth. For example, Sempervivum tectorum (hens-and-chickens) has a common name of roof houseleek because it can be grown on roofs and act as shingles. Another possibly more common name for this same species is hen-and-chickens.